Alright, that's not incredibly enigmatic or subtle in the slightest - it's doubtful that the next set of tables released for Pinball FX 2 will be based on Valve itself. No, this is more likely to be things like Team Fortress 2 and DOTA 2 tables, at a guess. Actually, DOTA 2 in pinball form would work really well, it being lane-based and all. 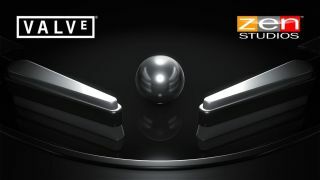 Zen Studios' previous tie-in tables have generally been excellent fun, capturing the mood of the game or franchise they're based on while offering a solid, enjoyable and thoroughly compulsive game of pinballing goodness to play along on. Also I'm pretty good at it, so I'm obviously going to like it. So we've got Valve-based tables coming to Pinball FX 2, or... there's two flippers and a ball, which added together makes three things... oh dear god, Half Life 3 confirmed - and it's a pinball game.